Margaret Preston was educated at Aberdeen University during which time she studied flute with Richard Chester (RSNO). Post Graduate studies took her to Trinity College London, and also private lessons with William Bennet and Lenore Smith. Concerts given during this period were in prestigious venues such as the Wigmore Hall and the Purcell Room. 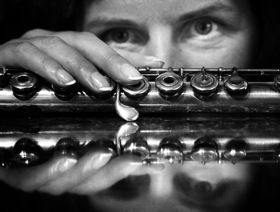 Margaret has a busy musical career playing with a number of groups including Apollo's Banquet, Aberdeen Sinfonietta, The Yggdrasil Quartet and in duos with Joseph Long, Alina Bzhezhinska, and Anne Chaurand. Her recitals have taken her to London, Canada, Norway, Belgium and Russia as well as throughout Scotland. Her radio broadcasts have included BBC Radio Scotland, and Classic FM. Television appearances include University of Aberdeen Educational Documentaries and Early Music Programmes. CD recordings are "My Delyt" and "Music of Castle Fraser". She has released a CD for flute and piano with Joseph Long. The acclaimed cd, entitled Beltane for flute and piano features music from twentieth and twenty-first centuries. Margaret has been writing poetry for three years contributing to NEOS "A breath of fresh air" 2007 and has written music for film documentaries and art films, orchestral music, songs and chamber music. In September 2008 she was chairman and founder of a new festival for the Arts: The SEE. SALT+SOUND festival.